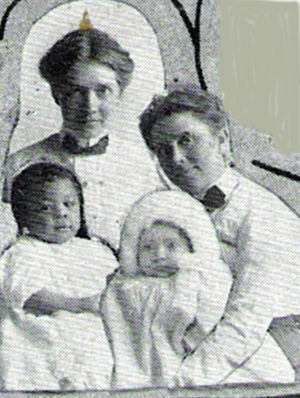 Maude Chatham (left) with the first baby born in the Beulah Home. Clara Schafer (right) holds another baby. From Twenty-Five Years of Rescue Work: Beulah Home 1909-1934. Maude Elizabeth Chatham was a ministering sister, pastor and institution founder in the Canada and Canadian Northwest Conferences of the Mennonite Brethren in Christ Church. She was born 25 March 1870, the first-born of newly-arrived immigrants from England, John Chatham (born July 1843) and Ellen Alice Smith (1846-1926). Eventually six sons were added to the family. In 1871 the family was living in Blanchard Township, Perth County, Ontario and in 1881 in Peel Township in Wellington County. Maude never married. She died in Vancouver, British Columbia on 23 November 1951. Although the family identified with the Church of England, shortly before Maude Chatham turned 18, she was converted through the preaching of Janet (Douglas) Hall, the first female preacher of the Mennonite Brethren in Christ Church (MBiC). Janet Douglas was pastor in charge of the Dornoch MBiC congregation 1886-1887, and preached for two series of evangelistic services for nearby Kilsyth so successfully it was added to the Elmwood circuit under Henry S Hallman with Janet Douglas as helper, 1887-1888. Kilsyth was south of Owen Sound where the Chatham family were farming by 1891. At that time and also in 1901, the family reported being “Mennonite” in the Canada census. In 1891, Maude Chatham applied as a probationer to the Canada Conference of the MBiC and in 1892, was assigned as an assistant to Elder Peter Cober, then the pastor of Kilsyth and Dornoch. It was a common pattern of the Canada Conference to give probationers their first experience of public ministry in areas near their home. From 1893-1895 she was a helper on the large Markham, York County, circuit under David S. Shantz; from 1895-1898 she was assigned to work as an evangelist in tabernacle and protracted meetings around Ontario, and as the pioneer pastor of a mission in St. Thomas 1897. Sarah (Klahr) Feldges assisted Maude in St. Thomas 1898-99. Then, in 1899, Maude was stationed at Collingwood with her brother Ed Chatham (ordained in 1897). In 1900, Ed moved to Alberta hoping to improve his health and Maude was briefly assisted by Sarah McQuarrie. When Ed got worse, Maude followed Ed to Didsbury, to nurse him until his death from tuberculosis in December of that year. Maude Chatham remained in Alberta, taking assignments with the Mennonite Brethren in Christ around Didsbury as an evangelist with various temporary locations of service. She was the preacher at Carstairs, 1903-1904. From 1905-1906, she was the helper to Elder Samuel Shelley Stauffer at Didsbury, and pastor at Mayton/May City after a revival established a congregation, 1906-1907. In 1907 the new MBiC Canadian Northwest Conference assigned Maude and Clara (Schafer) Price to begin mission activities in Edmonton. The institutions they began were operated interdenominationally because of the cost: first a homeless men’s hostel (which continued until World War I rendered it unnecessary), then a home for unwed mothers called Beulah Home (1909) which continued until 1989. In 1915 Maude started Beulah Mission Bible Training School (Edmonton Bible Institute) that in its brief life trained workers who became prominent in the MBiC Canadian Northwest Conference. Maude was also considered a founding preacher of the Beulah Mission was reorganized as a Christian and Missionary Alliance congregation in 1921. In 1919 Maude was not well and resigned as superintendent from Beulah Mission. There was dissatisfaction and misunderstandings from the Northwest Conference as well, which suspended her in 1920. The Bible School closed. Former co-worker Mary “Minnie” (White) Finlay was appointed over the mothers’ home in 1922 after 3 years under non-MBiC superintendents. In 1921 Maude was living on the Okanagan Valley (B.C.) farm of her brother Ernest Frederick Chatham with her mother and an adopted girl from Alberta. By 1922 she and her mother had moved into Vancouver, attending a Free Methodist Church. In 1927 she was seriously injured in a vehicle accident which took years of recovery, although she testified to a miraculous healing from an infection in 1929. Maude Chatham may have left the Canadian Northwest Conference, but her participation in the Mennonite Brethren in Christ Church continued in the form of visits and devotional writings printed in the Gospel Banner. Maude had been writing reports plus a dozen devotionals since early in her time as a minister in 1893, especially when she was an associate editor of the Gospel Banner 1915-1919. From 1917 to 1951, she added around 115 articles, plus occasional obituaries of MBiC people and testimonies. Maude’s themes were mostly the Christian life, its providences, trials and joys. “Beulah Home Golden Anniversary 1909-1959.” Brochure. Edmonton, Alberta. Canada Census: 1871, 1881, 1891, 1901, 1906, 1911, 1916, 1921. Chatham, Maude. “Testimony from Wallace Mission.” Gospel Banner (15 December 1887): 4. Chatham, Maude. “Beulah Home, Edmonton, Alberta.” Gospel Banner (29 May 1919): 12-13. Chatham, Maude. “God Wrote the Obituary.” Gospel Banner 24 (January 1952): 9. “Ellen Alice Chatham.” Gospel Banner (30 December 1926):14. Finlay, Mary A, ed. Twenty-Five Years of Rescue Work: Beulah Home 1909-1934. Edmonton, AB: Beulah Home, 1934. Huffman, Jasper A., ed. History of the Mennonite Brethren in Christ Church. New Carlisle, Ohio: The Bethel Pub. Co, 1920. Available in full electronic text at http://www.archive.org/details/historymennonit00huffgoog: 130-136, 218-219. Reynolds, Lindsay. Rebirth: The Redevelopment of the Christian and Missionary Alliance in Canada. Willowdale, ON: The Christian and Missionary Alliance in Canada, 1992: 98-103. Storms, Everek R. History of the United Missionary Church. Elkhart, Indiana: The Bethel Publ. Co., 1958: 157-158, 252. Swalm, Noah and Olive Swalm. History of the United Missionary Church Canada Northwest District 1894-1962. Didsbury, AB: Canadian Northwest District, 1965. Fuller, Clare. "Chatham, Maude Elizabeth (1870-1951)." Global Anabaptist Mennonite Encyclopedia Online. May 2015. Web. 23 Apr 2019. http://gameo.org/index.php?title=Chatham,_Maude_Elizabeth_(1870-1951)&oldid=132853. Fuller, Clare. (May 2015). Chatham, Maude Elizabeth (1870-1951). Global Anabaptist Mennonite Encyclopedia Online. Retrieved 23 April 2019, from http://gameo.org/index.php?title=Chatham,_Maude_Elizabeth_(1870-1951)&oldid=132853. This page was last modified on 30 November 2015, at 16:37.